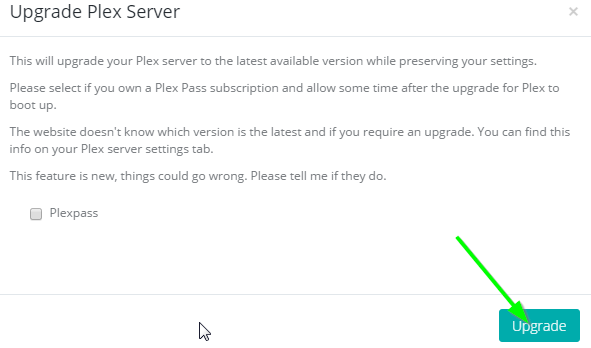 Since Plex doesn't have auto-update on Linux ( our Appboxes are on Linux) you will have to manually update Plex by following couple of easy steps bellow. On your Plex details in Actions menu choose Upgrade Version from your dropdown list. You will get a Window as shown below where it will say Upgrade Plex Server. In the right bottom corner of the window press Upgrade (if you are using Plexpass make sure to check it). After that Plex will be updated. If Plex gets stuck on Upgrading , after some time try repeating previous steps for upgrading Plex. If the issues hasn't been solved, raise a ticket..